I've watched a wider range of older Spanish films this year, so for that reason I'm dividing my 'favourites of 2014' choices into 'old' (anything before 2013) and 'new' (2013/2014 - which will appear later this week as Part Two). 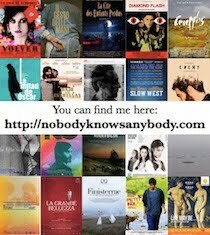 I've only listed films that I hadn't seen before this year, otherwise the likes of Muerte de un ciclista, El verdugo, and El día de la bestia would be included. 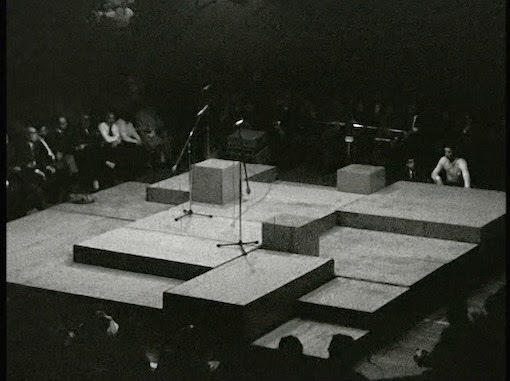 I dutifully worked my way through Intermedio's boxset of Pere Portabella's complete works fully intending to write about the set as a whole but - as is so often the case - it simply took too long for me to finish the set. I should have started writing about them as I went along. With the exception of his two political documentaries - El sopar / The Dinner (1974) and the three-hour epic that is Informe general sobre algunas cuestiones de interés para una proyección pública (1976) - I preferred Portabella's short films over his feature-length ones. Poetes catalans is my favourite from the set overall, a thirty minute underground film of an illegal gathering - the First Popular Festival of Catalan Poetry (the speaking of Catalan in public was banned during the Franco dictatorship) in Barcelona 25th May 1970, in solidarity with political prisoners. Shooting in black and white Portabella frames the event almost like a boxing match, the raised stage resembling a boxing ring and the poets (Agustí Bartra, Joan Oliver (Pere IV), Salvador Espriu, Joan Brossa, Francesc Vallverdú and Gabriel Ferrater) not pulling any punches in their attacks on the State and its forces. But it's the reaction of the crowd that makes it so electrifying - the cry of 'Libertad! Libertad!' [Liberty! Liberty!] (and later 'Amnestia!' [Amnesty!]) that sporadically breaks out in response to the poetry made my hair stand on end. Sadly it doesn't seem to be online anywhere and the films aren't for sale individually (although the boxset is fully subtitled). a.k.a. The film I lost August to - I wrote a long essay (here) about the injustices that befell the documentary and its director after its release, but also tried to write about it as a cinematic text because although the censorship tends to be the main topic of discussion in relation to Rocío, it is a visually distinctive - and hauntingly beautiful - piece of filmmaking. I still can't really explain the strange spell the film cast over me. I may return to it at some point because I initially wanted to look at how the power relations / social hierarchies within the region it depicts are reflected in the editing, but that was too large a topic for the essay I had started writing (and I felt it would require more research than I had time for at that point). The censored version is available with English subtitles on YouTube (the excised sections are indicated by a black screen with a timer showing the duration), and the uncensored version is included with this book (as is a documentary about the legal battle) but without subtitles. Winner of the European Documentary Award at the Seville Film Festival in 2012, León Siminiani's film is part travelogue, part diary, part confessional, and part embittered love letter. In the aftermath of the break-up of a long term relationship - swiftly followed by the loss of his job as a director of children's TV series - the director decided to return to his first love (cinema) and try to make a film as a way of fighting incipient depression. He decides to head to India in search of his film...but realises that instead of searching, he's actually fleeing something else. He returns to Madrid, but things don't get any easier there as he tries to work out what he is really looking for (and also finish the film). 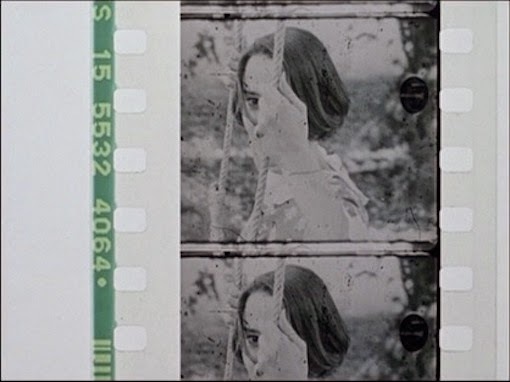 I often find diary films irritating but León Siminiani's dry humour and a good measure of self-awareness (his voiceover - as is explained within the film itself - was recorded months later, allowing him the benefit of hindsight as he assembled the film and caught sight of his fluctuating state of mind) mean that he avoids self-indulgence - what instead emerges is a sincere and introspective quest and an eventual realisation that you have to tell your own story (rather than somebody else's). A magic trick, a sleight of hand made all the more potent due to my misreading an untranslated cue card (although the fact that it worked even with this misunderstanding is a testament to the quality of Guerin's game), and a playful dissection of film language and form. I wrote about it here. This screened directly before Costa da Morte (which - it will come as no surprise - features in the second instalment of this list) at the Bradford Film Festival but it merits its own entry. 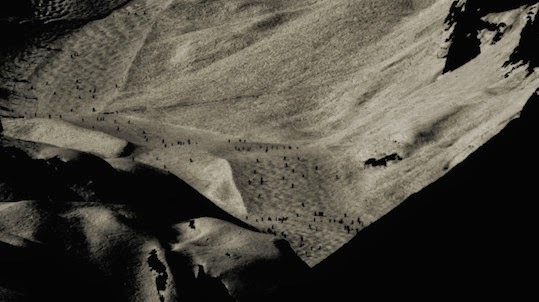 It starts out almost like an ink painting in motion, with the abstract shadows and contours eventually revealed as a snow-covered mountain complete with ant-like skiers making their way up and down. Fourteen minutes of spectral and ephemeral beauty. I'm jealous of anyone who got to see this in a cinema because I think its magic must reach full potential in the cavernous dark. An old uninhabited house reveals its layers and unexpectedly flickers into life at night with 'memories' of the region and its former owners playing out across its walls in the form of old films. Mystery and visual poetry in films can often feel like affectation - this feels organic and I found it genuinely enchanting. I wrote about it here. I wrote about the film last month as my contribution to the Late Film blogathon. 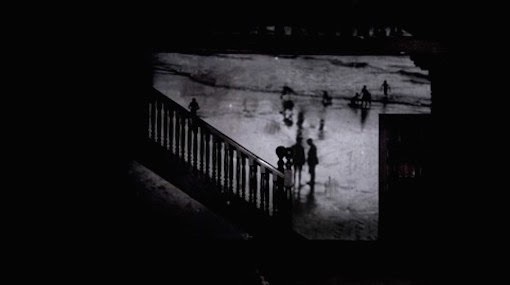 Cinema as bewitchment combines with the desire to lose oneself in Zulueta's tale of addiction and vampiric cameras. A strangely mesmerising and disturbing film. Reviewed here. I've seen relatively few of Berlanga's films because not very many of them are available with subtitles and I struggle with the audio on older films. 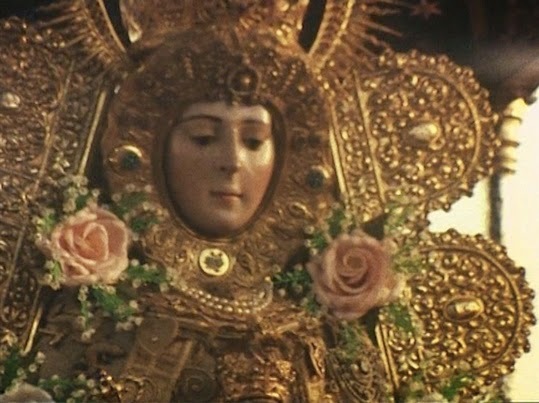 In this case, I had the luxury of seeing it subtitled and on the big screen at the Leeds Film Festival as part of the Berlanga and Bardem retrospective (I saw it in a double bill with Muerte de un ciclista). I overheard a couple sitting behind me saying that they found Plácido too loud ("too shouty") but the 'cacophonous rabble' aspect of Berlanga's ensembles is one of my favourite things about his films (characters frequently talk over the top of each other in increasingly anarchic scenes as more and more of them join in the inevitable disagreements). This also deeply and darkly funny - sharply skewering the false charity of the well-to-do in the face of genuine need. Reviewed here. I've found watching some of Recha's other films as akin to watching paint dry, so this one took me by surprise from the slinky soundtrack of its opening titles onwards. It has one of the most genuinely upsetting sequences (near the end of the film) I've seen this year and is all the more powerful for feeling truthful - for being true to the social circumstances in which its young protagonist (an excellent performance by Marc Soto) finds himself rather than offering the false comfort of a happy ending. 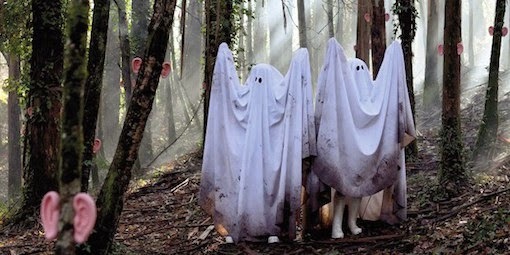 I like the DIY aesthetic (at odds with Eduard Grau's painterly cinematography) of Caballero's bizarre film, which involves Russian-speaking ghosts who are clearly 'made' out of white sheets, a trusty horse that occasionally becomes a somewhat ropey animatronic model, and trees with pink ears that look like they've escaped from a Mr Potatohead. Also contains reindeer. Surreal, sometimes baffling, but consistently funny. 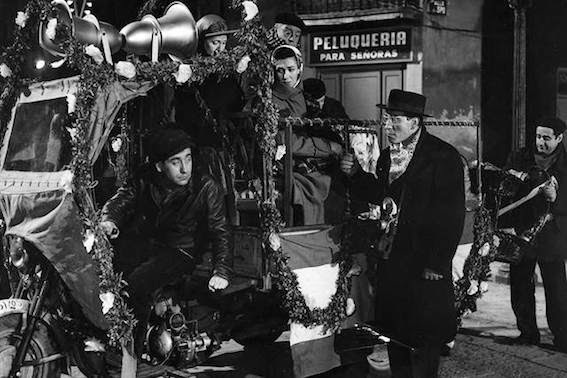 Bertsolari (Asier Altuna, 2011), Los golfos (Carlos Saura, 1960), Libertarias (Vicente Aranda, 1996), Umbracle (Pere Portabella, 1972), Uno de los dos no puede estar equivocado (Pablo Llorca, 2007). 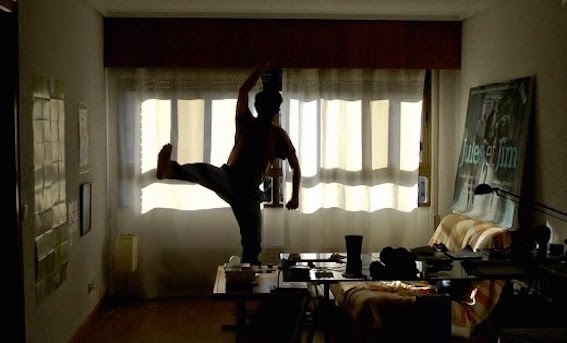 UPDATE: 'My Favourite Spanish Films of 2014, Part Two: New' can be found here.